I Dug This Movie Out Of My Rack Last Night. [ external image ]It was its first play for a long time. Its still in my top ten list of the greatest films ever made. The music is a wonderful. Even Tom Cruise put in his best ever work to date. Every actor in this film should of got a Oscar IMO. If you have never seen it? The double DVD can be had for 2p now. You need three hours to watch it though. The start is one of the best,If not the best intro to a film ever made. You won't ever see a ending like it in any other film. Re: I Dug This Movie Out Of My Rack Last Night. Almost everyone I know loves this film. I have about three friends who do not, and I am afraid that I am with them. It thought it was very influenced by Robert Altman, as was 'Boogie Nights'. I like Altman's small films , 'like 'Cookie's Fortune', but not his grandiose works, like 'The Player', which seem to be an influence on this. 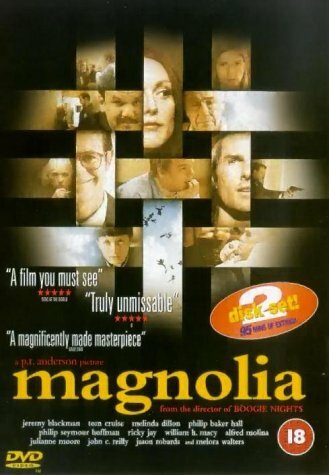 I just felt that 'Magnolia' had too much acting in it, rather like a lot of sc-fi films now have too many effects, the acting in this never stopped, or relaxed to a watchable level. More than that, I didn't feel that the ending tied thing together to any satisfaction, I felt that I had endured a lot of hysteria for little pay off. As I said almost everyone I know loves this, and many other Paul Anderson films, just not for me.